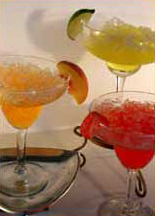 Reuters reported that fruity alcoholic drinks may be good for you! Adding ethanol -- the type of alcohol found in rum, vodka, tequila and other spirits -- boosted the antioxidant nutrients in strawberries and blackberries, the researchers found. The study was done jointly by the USDA and Kasetsart University in Thailand. So, Bloody Marys, Pina Coloadas, and Daiquiris can now be considered “health food.” I’ll drink to that!